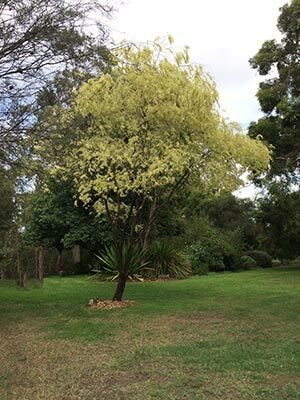 Agonis flexuosa or Willow Myrtle is originally from Southern Western Australia. A small to medium sized tree with attractive weeping foliage. Masses of small white flowers in spring are attractive to bees. Reaching 5-6m Agonis flexuosa cultivars make a great small tree. The example pictured right is Agonis flexuosa variegata, aged at around 60 years and growing in the Maranoa gardens in Melbourne. Easy care in full sun and a well drained soil. Drought tolerant once established and although this is a species that can be pruned, the graceful weeping habits means it is best left to its own devices. Underused in landscaping, Agonis flexuosa can be used as a specimen tree or planted as a hedging plant. If pruned regularly it will form a good semi formal hedge. Excellent for positions where it will receive full sun and little care. This is a tree that when un pruned has a reasonably open habit and lends itself to under planting with other hardy native plants. Try Pimelea, Adenanthos and Acacia cognata. Agonis flexuosa variegata – We think the best and longest lived of all of the varieties. Agonis flexuosa ‘Burgundy’ with its attractive deeper burgundy colored new growth. Agonis flexuosa ‘After Dark’ – purple to burgundy foliage, darker in winter.